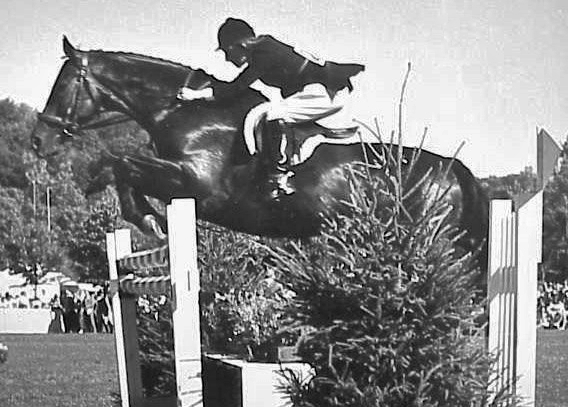 The early to mid 60s was a time rich with top Working Hunters at the A Shows (Isgilde, Let’s Dance, Captain Flash to name a few). One of the very best was the Thoroughbred, Navy Commander. His story is one of winning, love, and families (both human and equine). It all started when the seal brown colt was foaled at Fair View Farm, in Landrum, South Carolina in 1956. He had royal bloodlines, being by Admiral Tan (War Admiral – Even Tan, by Equipoise) and out of the great producer Eastmas (Easton – Goldenmas, by *Hallowmas). Navy Commander’s dam, Eastmas, was also the dam of show horse greats Colonymas and Fiddler’s Miss (who became Benny O’Meara’s Jumper, Grey Lady) plus she was the dam of the top Hunter stallion Catch On Fire. 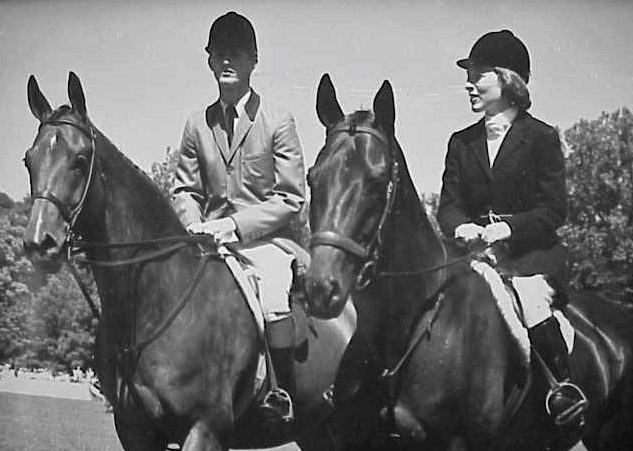 In the 1950s, J. Arthur Reynolds and his family (wife Edna, sons Bobby and Bucky, and daughter Betty) operated a show and fox hunting stable in Tryon, North Carolina (neighbor to Landrum, SC) and had a young horseman named Red Frazier working for them. When the farm next door to them was sold to the new Converse College President, Dr. Oliver C. Carmichael, Jr., in 1956, Mr. Reynolds was asked by Dr. Carmichael who he would suggest to run the horse operation at Block House. Mr. Reynolds suggested Red Frazier and Red was hired. During his time at Block House, Red bought some nice horses for Dr. Carmichael including Cap And Gown, Colonymas, Fiddler’s Miss, and the brown colt that would become Navy Commander. Dr. Carmichael, with the help of his wife Ernestine, named his new brown colt Navy Commander because he had been a Commander in the Navy and the colt was by Admiral Tan. It was a perfect fit. Red Frazier broke and started Navy Commander at his first shows but when Dr. Carmichael moved to South Bend, Indiana to take over his family’s business and moved his horses, Red lasted one Winter and decided it was too cold for him and returned to the South. Dr. Carmichael then hired J. Arthur Reynolds and his family to move to Niles, Michigan (right across the border from South Bend) in 1961 to run his horse operation and to design a state-of-the-art show-barn complex for him including a heated indoor ring. Bucky Reynolds became Laughin’ Place’s rider for all of their show horses except one – Navy Commander. Although Navy Commander was a big horse and Bucky was an average-size man, he preferred a lighter rider because of his tender back so Bucky’s sister Betty started riding Navy (as she always called him). They were a match made in Heaven. Navy Commander was a big, galloping horse that loved outside courses, but he also loved the small ring at Madison Square Garden. Betty and Navy’s first big win came in 1961 when they won the $2500 Working Hunter Stake at the National Horse Show (that was a whole lot of money for a class at that time). They returned to be Working Hunter Champion two times (1962 and 1964) and Reserve once (in 1963 to Isgilde after hacking off for Champion). Virginia had a prestigious Summer circuit in August every year in the early to mid 60’s. Horses, riders, and owners from all over the country would come to show. The four shows that made up the “Virginia Circuit” were Glenmore Hunt Horse Show in Staunton, Bath County Horse Show in Hot Springs, Deep Run Horse Show near Richmond, and finally the Warrenton Horse Show on Labor Day Weekend. Circuit awards were given to each of the Hunter divisions. For several years in a row, Navy Commander won the Circuit Champion for Working Hunters. 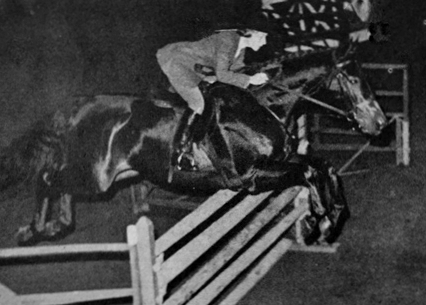 Betty Reynolds Oare on Navy Commander at The Royal Winter Fair in Toronto in 1962. Photo by Freudy. Navy Commander, with Betty Reynolds Oare riding, was Champion at A shows throughout the country. They were AHSA Working Hunter Horse Of The Year in 1962 and also captured the Working Hunter Championship at the Pennsylvania National (Harrisburg), the National Horse Show at Madison Square Garden, and the Royal Winter Fair (Toronto) that same year. At Toronto, they were tied for Champion with Let’s Dance, ridden by Rodney Jenkins, who had won the Under Saddle, in addition to her over-fences points. The hack-offs were held in the Hitching Ring (where all of the carts, wagons, and carriages were stored), and in those days the judges were allowed to ride the horses to pick the winner. The judge from England chose to ride each horse in the hack-off. Navy performed like a champ. Let’s Dance did not like the hitching ring nor the judge’s Evening Tails hitting her back one little bit so Navy, although the lesser of the two movers, won the hack-off and was Champion. In March of 1964, Betty Reynolds married Dr. Carmichael’s nephew, Ernie Oare, whom she met at the Ox Ridge Horse Show in 1960. 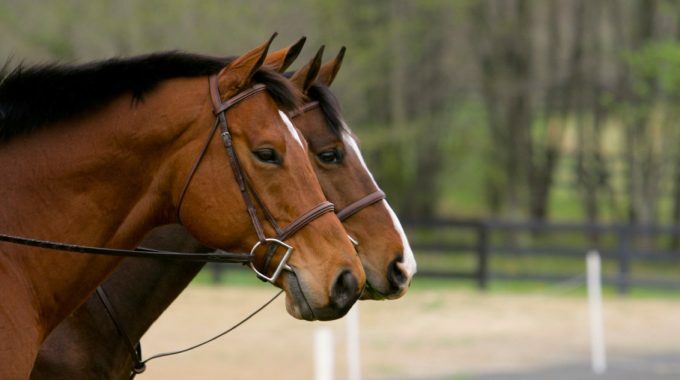 It has been a love that has endured many years even though when Ernie had a fall at the 1963 Oak Brook Horse Show when he rode Navy in the Working Hunter – Amateur To Ride Class, Betty went after Navy instead of checking on Ernie. At the Warrenton Horse Show during Labor Day Weekend of 1964, Ernie presented Betty with Navy Commander as a late wedding present. From then on, Navy Commander was shown as being owned by Mr. and Mrs. Ernest M. Oare. Rodney Jenkins on Blue Plum, owned by Bert Firestone, and Betty Reynolds Oare on Navy Commander in the Opening Parade at the Cleveland Grand Prix in 1965. Photo by Marshall Hawkins. The Reynolds family and the Oares moved to Warrenton, Virginia in 1965 which is also the year that the first Grand Prix in the United States was held in Chagrin, Ohio. 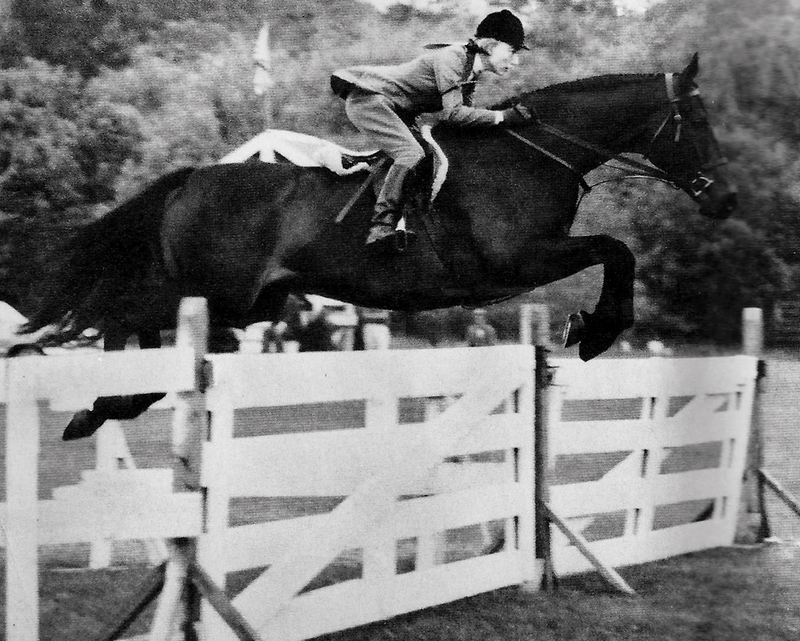 Although neither Navy or Betty had done the Jumpers before, Mr. Reynolds thought that it would be fun for Betty to show Navy in the Cleveland Grand Prix. All of the horses and riders paraded before the class’s start. Betty on Navy Commander walked side-by-side with Betty’s friend from Virginia, Rodney Jenkins on Bert Firestone’s Blue Plum. 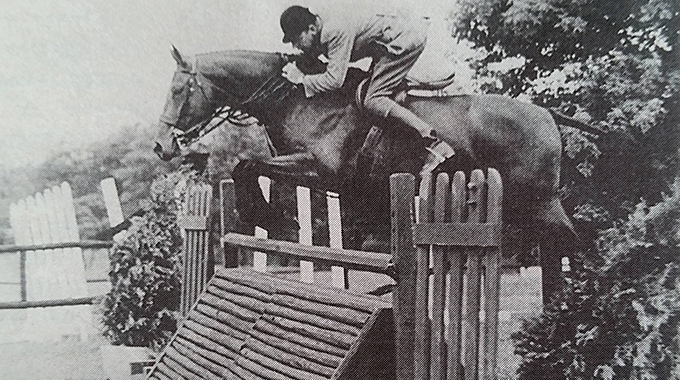 Betty said that Navy jumped around the course beautifully – over the water jump, the Liverpool, the Cleveland Wall, and all of the others. They finished with four faults, which Betty attributed to her riding the course as if it were a Hunter course and jumping in too strongly to the tight combination. Betty Reynolds Oare on Navy Commander at the Cleveland Grand Prix in 1965. Photo by Marshall Hawkins. 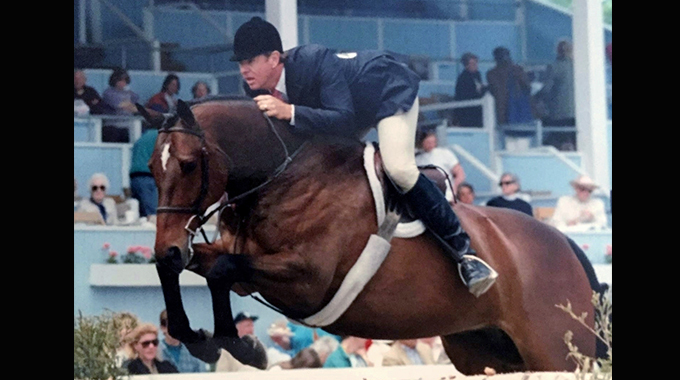 After his retirement from the show ring, Navy Commander lived out his days turned out at Lewis Wiley’s Gordonsdale Farm, in The Plains, Virginia. He ruled the roost. When the time finally came to put Navy down, Ernie made sure that Betty was out of town. He then buried him at the farm that Betty and Ernie still own off of Springs Road in Warrenton. To Betty Reynolds Oare, Navy Commander was her horse of a lifetime. She still tears up when asked about the day that he had to be put down. Navy Commander was one of the truly great Working Hunters of all-time. He has been inducted into both the National Show Hunter Hall Of Fame and the Virginia Horse Show Association Hall Of Fame. What a great story/history, accomplishments, and horse of a lifetime for Betty. I just love that, as a hunter, she showed him in the Cleveland Grand Prix. What a thrill for Betty, especially that amazing picture of her and Rodney at the Grand Prix. Well done Marianne on another well written and amazing article. Thank you! So glad you enjoyed it as much as we did. Great article Marianne about a truly Fantastic Duo, Betty Oare and Navy Commander. Yes, it did bring a little mist to the left eye of this 6’4″ 290lb. pony tailed bearded Biker. I was on the “A Circuit” from late ’70-’76 working for & with the very best Horsemen, Horsewomen & Horses of that time; Jimmy Lee’s Belcort Farm, Sign The Card, Perfect Stranger, etc., Jane Womble Gaston(Simply the Best), Carl Knee’s Rocket Bottom Farm, Advanced Ticket, Michelle, Terry Rudd, Bernie Traurig’s Blood Stock Farm, Royal Blue, Jet Run, Rodney Jenkins, Philip A DeVita, Michael Hunter & so many more Best of The Best. Thank You All… Off the Farm now but on an Iron Horse I Ride……and to Marianne Taylor, my Girl Friend forever who always had a Smile & a Laugh to pick me up…Until that time…Happy Trails. Such a kind note! Thank you. I grew up riding at Laughin Place with Bob Egan. Lovely facility. Navy Commanders cooler hung in the trophy case. What a small world! That must have been so great. Great article Marianne truly enjoyed it, very glad you are writing about such things.